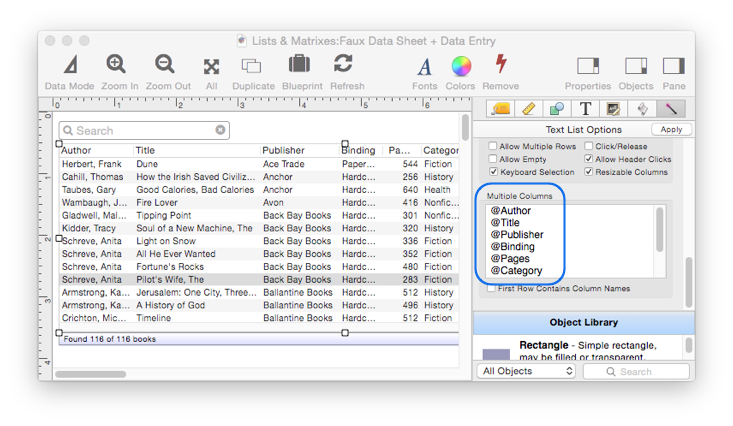 Panorama has special features that make it very easy to display information in a database in a Text List Object, or even to link the object with a database so that clicking on an item in the Text List automatically jumps to the corresponding record in the database. To illustrate these features this page will use this database of books. It only takes four steps to create a list that displays a field from the current database. Notice that you do not have to set up the Formula for this Text List object. If all of the fields are specified with the @ prefix, Panorama automatically figures out the formula for you. To display two or more database fields, simply add the field names to the Multiple Column area, prefixed with the @ symbol. You’ll probably also want to enable the Display Header option, as shown below. This displays the field names at the top of the list. When the fields are specified with the @ prefix, as they are in this example, the list automatically uses the same field widths and alignment as specified in the Data Sheet. In the example above, the numbers in the Price column are aligned on the right, because that is how the field is set up in the Data Sheet. Normally, the selected item in a Text List is completely independent of the current record of the database. This movie illustrates this – as different records are clicked in the list, the Data Sheet in the background is not affected. However, if the Database Navigator option is enabled, the Text List selection and the database current record will be locked together. Clicking on an item in the list will cause the database to jump to that spot (provided that the record is part of the current selection), so that the Text List can be used to navigate within the database (hence the name of the option). This link works in both directions – so clicking on a different record in the data sheet updates the selection in the Text List. Important: When the Database Navigator option is checked, the Selected Value option is ignored. 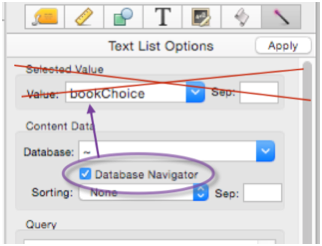 Even if you’ve specified a field or variable name for the Selected Value, the Text List won’t do anything with that field or variable if the Database Navigator option is enabled (so you might as well leave the Selected Value option blank). If you think about it, there’s really no need for a separate field or variable to hold the selected choice – you can always find that out directly from the database fields, as this Text Display Object does. This can be taken even further by adding text editing fields to the form (see Automatic Form Construction). Now I can choose a book on the left, then edit all the details on the right. All this without any programming at all. 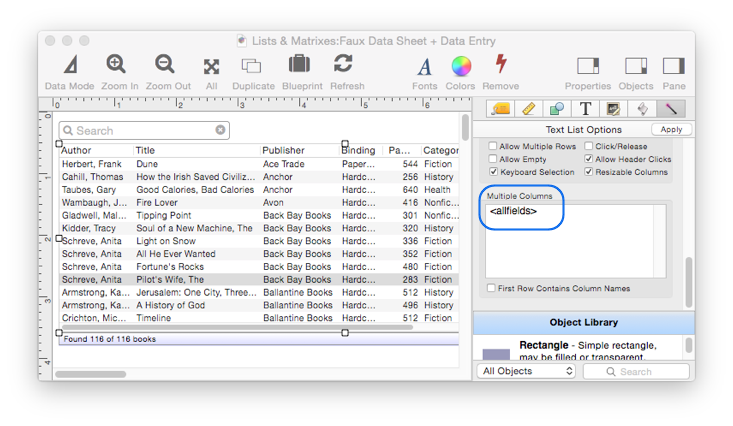 Using the techniques described in Text List Searching, a search option can be added to the Text List. As shown here, the list can be both searchable and linked to the database with the Database Navigation option. When the Text List is linked with a database, the Query formula should contain comparisons based on one or more database fields. This example will search based on the title. If you want the search to include all fields in the database, use the exportline() function. When the exportline() function is used, all fields are searched, even if they aren’t visible in the list. For example, I can search for all books by John Grisham, even though the book author isn’t displayed in the list. To learn more about setting up searching of a Text List, see Text List Searching. To display all fields, you could list all of them in the Multiple Columns area. You cannot combine the <allfields> tag with any other column definitions, it must be used by itself. So far all of the examples covered have shown a one-to-one correspondence between database fields and columns in the list. It is also possible to use a formula to create custom columns. In this example the first column is created by combining and rearranging the Title and Author columns, the second column is calculated from the Price field but adds a color tag to make the text green if the price is less than $15.00. The columns are separated by a tab character (generated by the tab() function in the formula below). Since the columns in the list don’t correspond with database columns, the names, widths, and alignment have to be defined manually. See Text List Multiple Columns to learn how to do this. In this example, the Price column actually does correspond to a database field, even though the Book column does not. So it is possible to define the width and alignment of the Price column automatically using the @ prefix, as shown here.